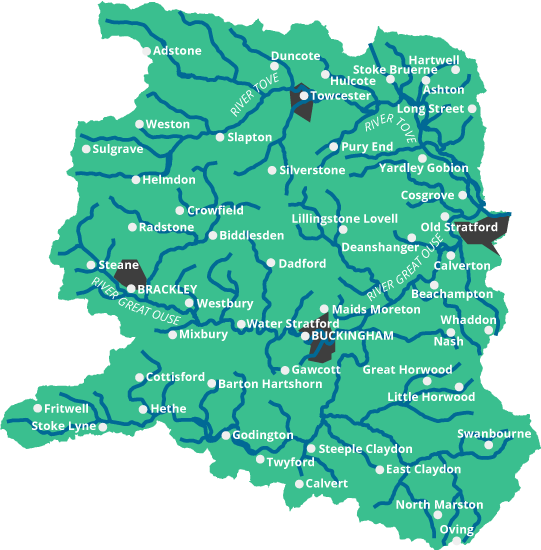 This catchment covers the upper reaches of the River Great Ouse, which rises just northeast of Brackley, flowing mainly eastwards to Wolverton, Milton Keynes. Other major tributaries are the Padbury and Clayden Brooks and River Tove. It is a mainly rural area with arable and livestock farming, and estate parkland. Main urban areas include Brackley, Towcester, Buckingham and the northwest outskirts of Milton Keynes. The permeable limestone geology, which underlies the north and west of the catchment, is an important aquifer. The catchment is noted for its angling interest (brown trout, dace, chub and barbel), water vole and otter populations.